We spoke with Congressman Ryan about added sugar, the farm bill, and his guilty food pleasures. In Real Food Revolution you detail our broken food system. Do you have one “big idea” that concerned eaters can rally around for change? Shift subsidies. We’re now subsidizing crops that are leading to highly processed foods made with high fructose corn syrup and soy oil because we’re making those crops and those products artificially cheap with taxpayers’ dollars. That’s leading to a great deal of sickness in our country. In five years, half the country is either going to have diabetes or pre-diabetes. If we took those billions of dollars from subsidizing those particular crops and we shifted them to farmers so that they could grow fresh fruits and vegetables, I think we would move in the direction of having healthy foods be affordable and accessible to all Americans and therefore use that food as our medicine to bring down health care costs. What do you say to the farmers and their lobbyists who like the current subsidy system? I think farmers will be fine as long as we say, “we just want you to grow something different and we’ll help create a market for you.” Our public institutions, our schools, our universities, and our prisons all spend a good deal of money on food budgets. So if we increased locally sourced fresh fruits and vegetables, lean meats, etc. [through subsidies] and tied the local farmers into those institutional markets, then they would have a place to sell the food. You have the food industry that can push back, but I think there’s a place for all of them in this new system. The bottom line is we’re a sick country and they need to do their duty to make sure that we move the system in a healthier direction. I’m sure there will be some big fights about it, which is why I’ve spent a good deal of time trying to rally people around the country to be a part of the movement, and so their members of Congress–whether they’re in Kansas or Ohio or New York City–have the political support to go out and push this change. You’re also highly critical of processed foods. Can you say more? Highly processed food is the main culprit. And added sugar. Take a container of yogurt. It says 24 grams of sugar on the label, but you have no idea what that means. There’s no daily allowance next to it either. I can’t picture myself giving my child six teaspoons of sugar and expecting them to behave normally. We wonder why they are bouncing off the walls. Then we discipline them or they try to sit in a desk and learn algebra. We’re setting these kids up for failure. Consumers appear to be waking up, as evident in the decline of junk food sales and McDonald’s recent announcement that it is phasing out antibiotics in chicken. But there’s little evidence that federal policy will catch up any time soon. How do we make change in Congress? I hate to say that but if you look at civil rights, if you look at women’s rights, Congress is always last. The country shifts and then Congress is last to come in and then they actually do something about it that is very important. You’ve got to build out the organic political movement that’s happening all across the country. Until you do that Congress is removed because there’s pressure to do other things on other areas and if you don’t get their attention and apply the political pressure, you never can get it done. You have two revealing stories in your book about interactions with Ohio farm bureau members and corporate food lobbyists who were angry when you voted against the last farm bill. Conventional wisdom dictates Democrats with that type of voting record in agriculture states like yours don’t last long in Congress. How do you pull it off? They were upset that I didn’t vote for the farm bill, but we’re with them on a lot of other issues and we are respectful of what they do. I explained that I voted against the bill because it’s continuing to create long-term deficits in Medicare and Medicaid. We’re not going to be able to afford a farm bill next time if half the country has diabetes or pre-diabetes because all our budgets will be spent taking care of people who are really sick. We have a great farm bureau in Ohio that I have sat down [with its leaders] on issues like the algae bloom in Lake Erie, where they actually had to shut off the water from a Toledo facility for a weekend. The Ohio Farm Bureau was there from the beginning and asked, “how can we be a part of the solution?” Which is why I am optimistic about changing the food system. So I think just being honest and not hating on them, not blaming them is the key. You mention Toledo. Des Moines, Iowa is having a similar issue with algae linked to farm runoff. Is throwing more conservation money at the problem going to solve it? What we’ve done in Ohio is ask the U.S. Environmental Protection Agency (EPA) to act more aggressively and expeditiously for clean water protection. We’re talking to the National Oceanic and Atmospheric Administration (NOAA) about completing the Great Lakes algae bloom report so that we can further understand exactly what’s happening there. We want more U.S. Department of Agriculture conservation funds going to address these problems. Sometimes it does take more investments. The problem really is that the farmers were doing what they were told to do by applying fertilizer. Better precision in application will help that. And we’ve continued to remove wetlands, which were the natural filter for a lot of this runoff. We need to go back and say these wetlands were here for a reason; they had a job to do. Do you have some favorite farmers in your district? Miller’s Farm is one of my local favorites. They do all grassfed meat, and use no antibiotics in their chickens. Generally we do soy and corn at pretty high levels, but we also have a good number of specialty producers. Ohio is kind of a prime place for trying to transform the food system and continuing to build out the specialty farms and sustainable farming. How have you changed your eating habits since learning more about the food system? The first story in the book is about how my brother busted me one night in a hotel room with chicken wings and ice cream. I eat a lot less chicken wings now than I used to and I try to have them baked instead of deep-fried. I pretty much cut out bread and pasta and growing up Italian that’s very hard. But my wife has a gluten allergy so we do spaghetti squash instead. We buy lean meat and chicken without antibiotics. That’s one of my big concerns–how many antibiotics we’re ingesting now. We have one basic rule if you want to be bad, you’ve got to be good. So you try to be good 75-80 percent of the time and then if you’re in an Italian restaurant in Youngstown, Ohio you probably need to order some tiramisu and split it between everybody. You remind your readers to be careful about blaming farmers because they’ve been put into a tough spot. Who’s responsible for our broken food system? The original idea [of the Green Revolution] was pretty noble: how are we going to feed the world and use the bounty of the United States and its transport capacity to feed the world? Applying industrial methods to farming increased output, but it went too far considering half the food we’re growing doesn’t go right to the table because its fed to animals or processed first. If there’s someone to point the finger at we have got to say to these food companies: You can’t add all the sugar because look at what’s happening to us. Look at these high levels of obesity. Look at these high levels of diabetes. These are national security issues. [Processed foods] are artificially cheap and affordable to average people in places like Youngstown and Akron, Ohio. Because there is also a high level of income inequality, people need to eat calories and they’re going to get them in the cheapest way they can. That’s why shifting subsidies to support healthy diets is critical. Fantastic idea! Thank you for leading the charge when so many are either afraid to do it or are being paid off by Monsanto and big agra. My hat is off to you! Not going to fly,corporate farmers won't let it. Thank you, thank you, thank you! You are fighting an uphill battle Im sure, but it is so refreshing to hear that someone from my home state is fighting for our food safety. All Americans deserve to have healthy foods and clear labeling to make better food choices! Rich or poor. Thank you Mr Ryan. Since the rest of the world doesn't want GMO, I think it's best to label it, and transfer the subsidies for it too. We've been subsidizing unhealthy foods and it shows. I'm celiac, and all the processed wheat and GMO doesn't help. My comment is more of a question. Where does Congressman Ryan stand on the GMO issue. Why is a company like Monsanto allowed so much power over the products farmers want to grow. How is it that they are allowed to force feed the world there genetic crops and get away with it when it is a well documented fact that Monsanto has made billions on their constant lying and misleading test results etc. When did Americans become so ignorant of how corruption and greed has taken over our democratic system. Prove it! Prove you are for healthier eating and against monsanto. Start a petition in the White House and then send it out to the American People to sign. When it comes back do something about it. Instead of sitting on it, or letting people buy other people. The White House Administration is there to protect the American People, that means they can in fact make a law against monsanto. However, they continue to do what they want and ignore the millions and billions of signatures already out there. They also ignore the MANY other Countries refusing monsanto. You all talk through the mouth all the time. It is now time to show the American People who side you are truly on. Do you have the balls to stand up for what is right? so happy to see DEMOCRATS trying... to do something that the republicans would never touch. I absolutely love the idea of food has to change. I am saddened that there is so conversation about the chemicals in our foods from sources like GMO's. I would like to see a word added to this platform...ORGANIC! If we as a country are going to make the change....let's go all the way!!! THANK YOU SO MUCH, MR. RYAN!! You are working and speaking on behalf of millions of Americans who feel the same way. Please stand strong against the lobbyists and BigAg who will work to quiet your voice. Thank you for working so hard to garner support from other members of Congress. I completely agree with you that this is a national security issue. You have an entire food revolution army behind you, lead the way! This is the first time I have read a real solution to our health/food problem. Please encourage farmers to follow the PolyFace Farm principles. They are healing their land with no fertilizer run off, while they grow food for several thousand people. Also buying land is just a dream for new want to farm people, the cost is so very high. Regulations regarding where & how we can farm for small farmers have to be different than those for the large scale farmers. Thank you for this push, but go the full distance. Organic farming is needed as soon as possible. Our beautiful Ohio farms are growing Monsanto's GM crops, and it's not a big secret. The little signs along the roads with the brand name and a bunch of numbers spell out that our foods and agricultural feeds are not natural. Subsidize ORGANIC farming. Require GMO Labeling in OHIO. The chemical applications on our food is skyrocketing and must come to an end. Round-Up Ready crops are killing us, contributing to increasing rates of autism, and a host of other problems, including diabetes. You are in a powerful position to lay down the law. Save Ohio's natural resources and help build a safe, enduring farming system. Thank you. between processed food and our health. I do not agree with the idea of changing labelling of such items of sugar as 6 teaspoons rather than 4 grams. it should be both methods. The American system if measures (cups and spoons) is seriously inadequate and outdated. The metric system is much better and is understood in the rest of the world who do not understand the American System. I lived in Britain when metrication was introduced and it took a while to mentally switch from Imperial Measures to Metric, but found it regressive when I moved to the US. 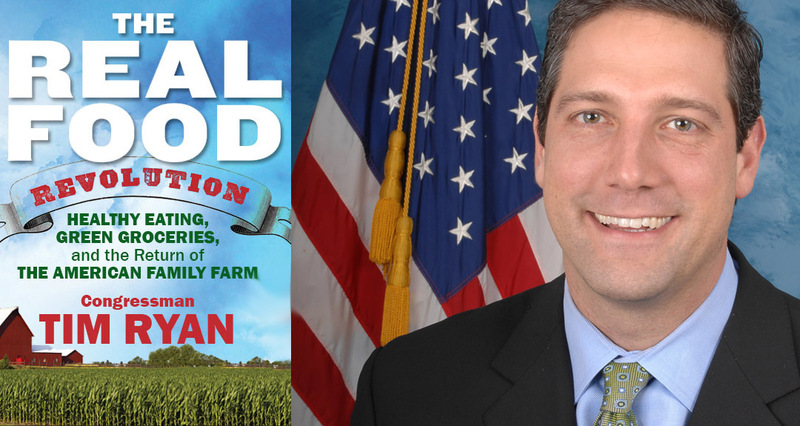 Much of what Tim Ryan proposes is excellent and if it leads to the extinction of GMO's it will be of benefit to all except the corrupt corporations who are only interested in their profits and not the health of the population. I know you have to start small, and that is good,as far as it goes. It seems that big corporations, such as Monsanto, are determined to take our choice out of the equation. We have the right to choose our food, and we will. We could use a little help from congress. He glosses over the fact that we KNOW what's responsible for most of the algal blooms: fertilizer. And we know what must be done: greatly reduce chemical fertilizers and use compost instead. We also know that farmers must be required to comply with the Clean Water Act and stop runoff. Require ag buffers along streams and wetlands. But he doesn't want to anger the all-powerful Farm Bureau so he soft-peddles the facts. I saw you on Fo x News tonight re: The Real Food Revolution-thank you for bringing awareness about ALL the toxins in our food. I have been sick for 5 years and am slowly figuring out it stems from the toxins in everything. I also believe it is a contributing factor to depression. Please continue to push this effort to make a huge difference. He talks a lot about sugar but sugar consumption has gone down, yet obesity is still rising. There's more to obesity/diabetes than just sugar consumption, though it is important to curb sugar consumption as much as possible. Great goals, but he's very wrong on policy, politics and the farm economy. Most farmers have long opposed subsidy programs, but it's the only thing Congressional Republicans (and Dems since 2001) will give us, (thus the trauma-Trump vote). Subsidies don't cause cheap prices that subsidize junk food or the change crops grown. Congress reduced and ended (historically multimillion $) price floor supply management programs, and since free markets fail on supply AND demand sides for agriculture, prices are cheap. Green subsidies preserve this & will never make up for the multitrillions. End subsidies and corn is even cheaper, says Agricultural Policy Analysis center, as land will go from cotton to corn. Fruits and veggies are also too cheap, (but higher than grains + grain subsidies,) and on far fewer acres, so if many farmers changed, it would crash those markets even farther. At Storm Lake rural forum Ryan called for funding corps and non-farm-related businesses, and nothing for farmers and cheap prices massively destroying infrastructure for diversity.